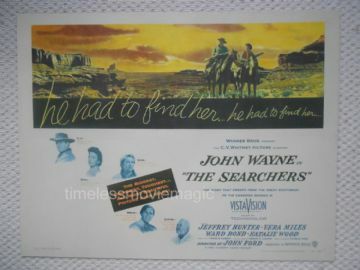 Original 1956 half sheet movie poster from the classic John Ford western ' The Searchers ' starring John Wayne, Vera Miles, Jeffrey Hunter and Ward Bond. The poster is in Fine- condition * and measures 22" x 28". About this poster - This poster was restored using the starch back method instead of the more common paper backing. This method gives the poster more feeling and allows the poster to be rolled. Pre restoration defects - The poster had a number of small creases especially in the top area. There were a few small pieces of tape on the edges of the poster. The back had paper tape on the top and bottom borders and the vertical/horizontal folds. There was no tearing or paper loss. About the restorer - The poster was restored beautifully by Mario Cueva at Lumiere Poster restoration. As you can now see the poster displays wonderfully and would be a premier piece in anybody's collection. The poster will be shipped flat between many pieces of sturdy cardboard.